It might not be the souped-up next-gen console that's top of your gaming wishlist, but Nintendo is bringing its teeny Wii Mini to the UK. 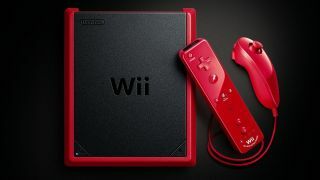 You'll be able to pick the diminutive console up from March 22 in its signature matte-black with a red border and, as Nintendo's release helpfully points out, it is smaller than the original Wii. Bundled with the Mini are a red Wii Remote Plus and a red Nunchuk controller, although you should be able to use most existing Wii accessories with the console too. Classic Wii games of varying vintage are being added to Nintendo Selects to coincide with the launch, with Mario Party 8, Wii Sports Resort, Mario Power Tennis and Super Paper Mario joining the roster which already includes The Legend of Zelda: Twilight Princess and Super Mario Galaxy. Nintendo Selects is basically just the name for a bunch of popular Nintendo games that you can pick up on the cheap. We're waiting on an official Wii Mini UK price, but the company promises 'big fun' from a 'mini price' and it's on sale for the equivalent of £62 in Canada so we're expecting bargainous things.